Caption slip reads: "Photographer: Monteverde. Date: 1952-05-30. Reporter: Reay. Assignment: Glendale & Forest Lawn. 85: Color Guard of United States Marine Corps recruiting station at entrance to Forest Lawn. 84: Color Guard and ROTC unit of Hoover High School. 80: Glendale High School band. 81: Contingent of American Legion Post No. 127. 43: Glendale Police Boys' band. 3: Clark Pomeroy of Spanish-American War Veterans re-reads General Order of May 5, 1868 establishing Memorial Day. 4: Lieutenant Governor Goodwin Knight delivers address. 44, 82 & 83: Lieutenant Governor Goodwin Knight lays wreath on symbolic grave. 17: Rear view of Mrs. Janet Hayde, reading Gettysburg Address. 18 & 35: 3 volleys fired over symbolic grave by Glendale High School firing squad. On left, Cadet Sergeant Howard Baldwin, on right, George Rollins, of American Legion Post 127, bugler. 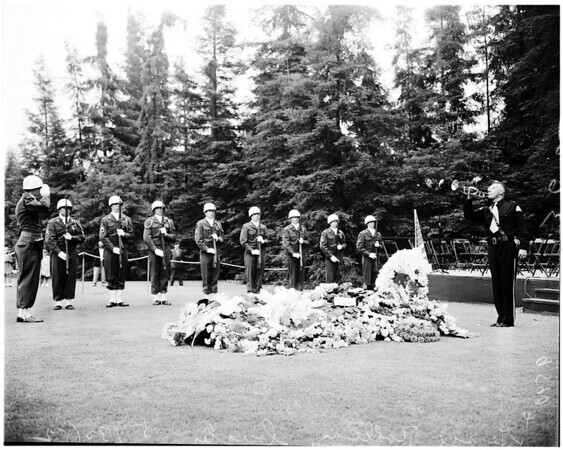 36: Tap played over symbolic grave covered with 40 wreaths placed by patriotic groups. George Rollins, bugler of American Legion Post 127, Glendale".